It's time for an online slots game that delivers twice as much as you'd expect. Introducing Double Ya Luck, a 3-payline casino game from Slots of Vegas that redefines what it means to get lucky. Don't let the three reels and three paylines fool you. 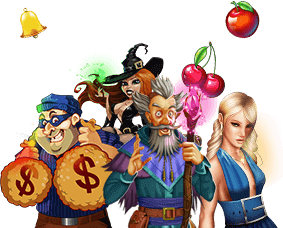 Double Ya Luck is packed with the type of rewards that you'd expect from a monster-sized slot machine. This one delivers with a top award of 10,000x your bet per line, two feature games that changes the way you think about payouts, and so much more. Ther's even a jackpot component to Double Ya Luck so good fortune really is in your corner. The name might be Double Ya Luck, but this could very well be the single easiest game in the Slots of Vegas arsenal. To get started make your bet and lines selections. This is a 3-line online slots game, so you can play between one and three lines. You can also bet between $0.05 and $5 per line. To make your selections, use the up and down arrows to the left and right of the Bet and Lines buttons. To lock in your bet, click the Spin button, which is located to the right of the Lines button. When the reels stop, you'll get paid out for matching the right symbols. It's easy to get carried away with a game like Double Ya Luck, especially with so many opportunities to double your winnings. That's why we recommend setting a specific bankroll for the week and make sure you stick with it. When you sit down to play Double Ya Luck, make sure you only commit no more than 5% of your bankroll with each spin. So if you've got $100 to work with, betting no more than $5 per spin is a smart move (if you can stick to 2.5% per spin, you'll be even better off). Scatter Symbol: In Double Ya Luck, the words "Ya" and "Luck" are scatter symbols, and so is the dice symbol. Substitute Symbol: Look for the Double symbol because it can substitute for all other symbols in the game, except for the 7 symbol and the scatter symbols. Gamble Feature: Hit the "Double", "Ya", and "Luck" symbols on the first three reels and you'll get to play a special 50/50 bonus game. Boardgame Feature: Hit one or more Dice and you'll get to play a virtual boardgame, complete with dice rolls and tokens that move about the board.